 Give a WOW is the premiere platform for peer to peer recognition in the workplace. Create a dynamic culture of appreciation through the social-media style interface that makes recognition simple, fun and meaningful. With Give a WOW, employees can give and receive recognition for great work in real time. Flexible for businesses small and large, Give a WOW is customized for your core values so that each recognition moment reinforces your mission on a daily basis. Discover the difference that Give a WOW can make in your workplace. 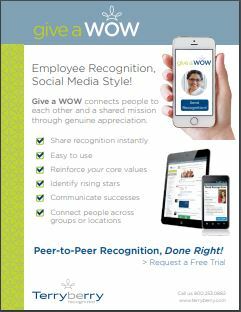 Contact us for a demo or to learn more about Terryberry’s Give a WOW peer to peer recognition program. Peer to peer employee recognition programs can help your company foster a sense of community and teamwork. When employees are able to publicly recognize each other for a job well done, it can add a big impact. It can also be a much more effective system in today’s global environment, where managers or other supervisors may not even be in the same location as their employees. Inviting employees to participate in giving recognition for great work when they see it is an important way to engage everyone in your organization. Terryberry’s Give a WOW program for peer-to-peer recognition awards allows employees to do just that. Give it a spin. 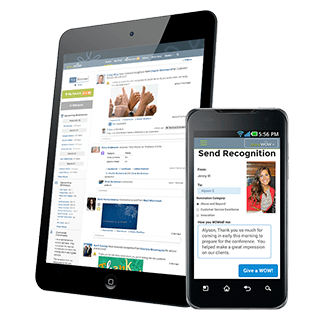 With our free 90 day trial, you can set up your peer-to-peer recognition website, add your core values, invite your team, and give and receive recognition! Give a WOW PRO can be custom-configured for your organization’s needs. Here are just a few of the additional options available in Give a WOW PRO. Your Brand. Your Culture. Your Give a WOW.